If you’re scouting for new #MeatlessMonday recipes, give this a try. Green wheat freekeh’s distinctive smoky taste, as well as its high levels of usable protein and fibre, make it ideal for vegetarian mains. Even better, the ingredients for this one tend to just fall out of the larder, so the only thing to worry about is your fresh veg component – a side of crudités and herbs, for example, or crisp-tender fine green beans. This recipe is derived from one in Sonia Uvezian’s excellent Recipes and Remembrances from an Eastern Mediterranean Kitchen. In a dry heavy frying pan, toast the pistachios over a medium to low heat, stirring constantly, until lightly browned and fragrant. Transfer to a bowl to cool. Repeat using the allspice berries, but transfer them once toasted to a mortar and crush finely. Do not attempt to toast the nuts and allspice together at once – this will just make your life difficult. In a large casserole, heat the olive oil. Add the onion and cook for 10 minutes or until soft and golden. Add the freekeh and cook, stirring for 2 minutes. Pour in the stock and bring the mixture to a boil. Lower the heat, cover the pan and simmer for 30 minutes or until the liquid is absorbed and the grains are tender. While the freekeh is simmering, gently melt the butter in the frying pan. Add the apricots, raisins, ground cinnamon and the allspice you crushed earlier. Cook, stirring frequently, over a medium-low heat until the fruit is plump and just starting to turn golden. 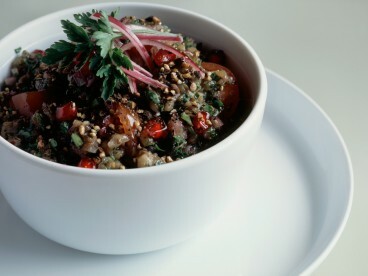 Remove the pan of cooked freekeh from the heat. Roughly chop the toasted pistachios and stir them into the pilaf. Follow with the sautéed fruit and adjust the seasoning to taste with salt and pepper. Serve hot. Green beans cooked in tomato and onion sauce – classic mezze – makes a great starter for this pilaf. Or if you’re pressed for time, just open a bag of peppery salad leaves, dress with lemon and serve alongside. Slivered almonds or pine kernels may be used instead of pistachios, but the colour of pistachios enhances the look of the dish. You could also use prunes, or a little chopped preserved lemon, instead of the dried apricots. The olive oil and butter make this pilaf gorgeously rich but there is plenty of leeway to skimp on the quantities if you prefer. For all its vegetarian worthiness, this pilaf also makes an excellent side dish for grilled chicken fillets seasoned with a little crushed allspice, or roast lamb. And you can use it as a poultry stuffing. 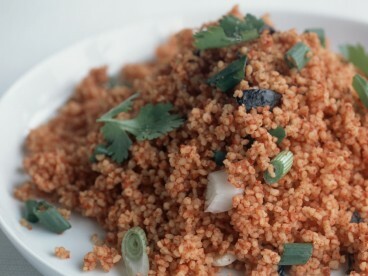 Following these basic instructions you can also make pilafs based on bulgur wheat and white rice. Reduce the quantity of liquid to 350ml and cut the cooking time to 15 minutes.